Today is the day you take out your old coins and declare this day, coin cleaning day. Get your copper coins out of the containers where they’ve been hiding for many years and get them cleaned. You don’t need any fancy gadgets or science kits to clean these coins, all you need are a few household ingredients and you will have shiny new coins in less than an hour. Before you start, it’s important to take note that for this cleaning coins experiment to work, you need coins made of copper; otherwise, this will not work. But the vinegar by itself didn’t clean the coin as well as the vinegar + salt solution! Why is that? But what about the ketchup? 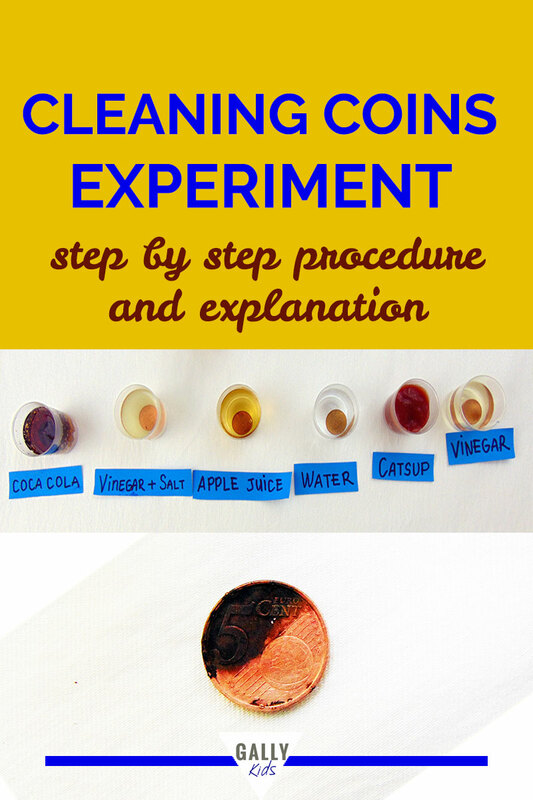 Why did the catsup clean the coin as well as the vinegar + salt solution? What can clean pennies the best? Why do you think coins lose their shine? We are going to put the coins into different liquids, which of these liquids do you think will clean them? 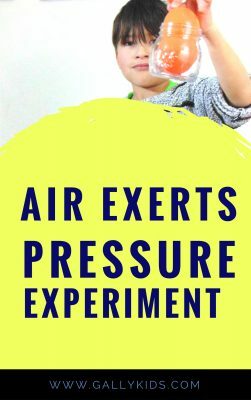 There are two different stages to this Science activity. You don’t have to do the 2nd one, but it’s also a good scientific experiment and you’ll even find out why the Statue of Liberty is the color that it is. First, prepare all your cups and line them up. Since we have 6 different liquids here, it’s best to properly label each cup. Write the name of each liquid on a strip of paper and put one strip beside the cup to mark it. Next, pour one liquid into each cup. So 1st cup will have catsup, 2nd will have coke, and so on. Afterwards, put one old coin in each cup. Leave the coins in the liquid for 10 minutes. (You may need to push the one in the catsup to get it fully submerged). 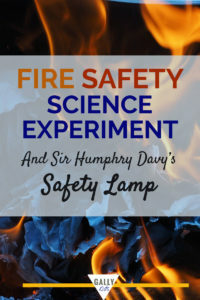 If you’re doing this with kids, this is a good time to ask them questions about the experiment. Which one do they think will clean the coin the most? What will happen when the liquid cleans the coin? After 10 minutes, use your tweezers to take the coins out of each cup. (we used our hands — very messy business especially with the catsup but the kids thought that was fun!) . Finally, wipe the coins dry with a tea towel or kitchen paper. Now closely look at each coin. Which one is the cleanest? the shiniest? Most of the liquids (except the water) should have somewhat cleaned the coin. The vinegar + salt mixture and the ketchup will have come out as the clear winners. So for the 2nd stage of this experiment, you will work on these two materials alone. First, put the coins back into the same mixture as the one you used in the first experiment. Remember, you will be working with only the vinegar salt mixture and the catsup. This means you will only have two cups to work with. Leave the coins for 10 minutes. After 10 minutes, take the coins out; but this time, don’t wipe the coins clean. Just put the coins on the tea towel and leave it to air dry. Finally, after about 30 minutes to 1 hour, look at the coins again. What has happened to the coins? So what just happened here? 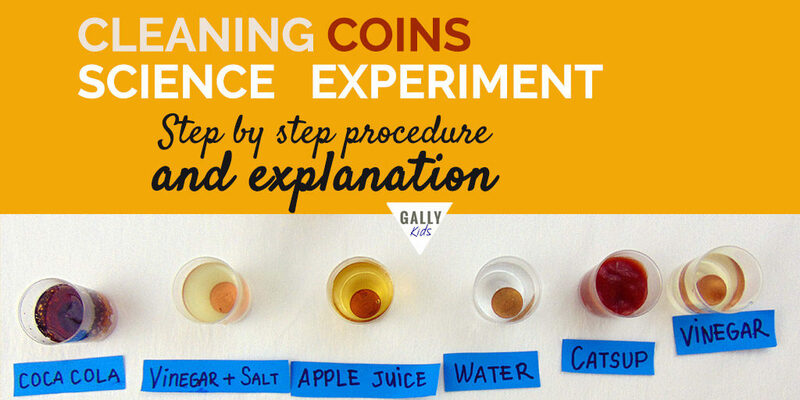 Did you get to the same conclusion that the ketchup and the vinegar + salt mixture cleaned the coins the most? Remember that at the very start, I said you should use only copper coins? There’s a reason for that. You see, copper coins are usually shiny and well, copper-colored. In time, however, they get darker, brownish and dull. The reason for this is that copper has quite the relationship with Oxygen that is they react to each other. So when the coin stays in your pocket or is passed from person to person or stays in that container where you keep all your pennies, the copper in the coin reacts with the oxygen in the air and turns into what is called copper oxide. Copper oxide is blackish. It’s that dull dark color that coats old coins. Also, Copper oxide easily dissolves in acid. And what is vinegar? It’s acid! So, the acetic acid in vinegar dissolves the copper oxide and cleans it. So if you look at the coin in the vinegar solution, it made the old coin a little bit brighter and less brown. But here’s the question that I’m sure is brewing in your mind…. 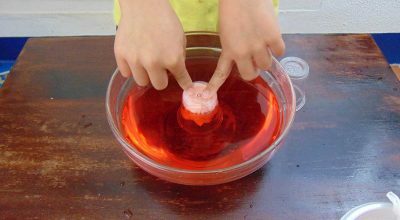 It turns out that when you mix vinegar and salt, a chemical reaction takes place and form what is called hydrochloric acid. And hydrochloric acid is so much more acidic than vinegar alone. Isn’t that amazing? You simply add salt to vinegar and you end up making an even more acidic concoction? That’s Chemistry in action for you! And because this mixture is way up high in the acidic scale, it cleaned the coin so much better and quicker than just vinegar. And now the 3rd question arises. Well, it’s time to look at what is in our catsup! And see what’s the science behind this phenomena. So in our case, we looked at the ingredients. We know that it’s mostly tomatoes – a quite acidic vegetable. But we think that that alone could not clean coins this quickly. So we proceeded to read the other ingredients and guess what we found? Salt! And it even had added acetic acid! You can only guess how highly acidic this ketchup must be! So there you go, that’s how it cleaned the coins too. 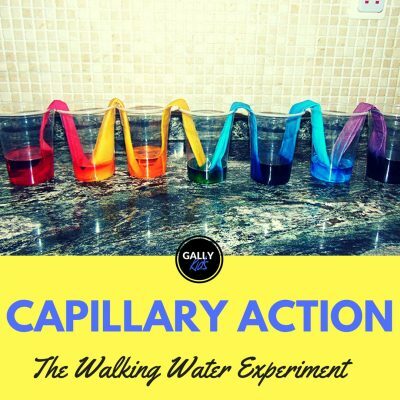 Did you do the 2nd stage of this cleaning coins experiment? What happened to the coins when air dried? Here’s what happened to your coin. When the vinegar cleaned the coin, it stripped away the coating and exposed the copper. 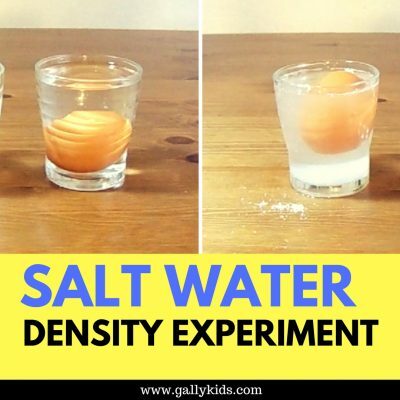 Now when you dipped it into the salt + vinegar solution and then air-dried it, it also took with it some chlorine which is often found in salt. And here’s where the science matters. Remember that copper turns dark brown when reacting with oxygen? Well, here’s something even more fascinating. When you add chlorine in that mix, the color turns bluish-green instead! This bluish-green color is called Malachite. It’s exactly the same reaction that’s happening to the dearly beloved Statue of Liberty! Yes, that’s right. The statue is made of copper and it has turned bluish-green because of this copper-oxygen-chlorine reaction. Isn’t that a cool and fun fact? 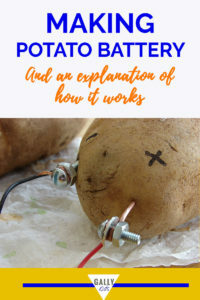 This website is helpful to me but,add more steps and I think it can be more helpful. The liquids didn’t clean the coins in 10 minutes so I think it needed to be for longer!